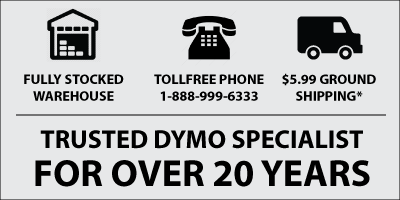 Dymo Rhino 18053 White Heat Shrink Tubes 3/8"
Dymo Rhino 3/8" Heat Shrink Label Tape Cartridges are compatible with all most Rhino and RhinoPro industrial label printers. Following is the complete list of compatible Rhino label makers. Dymo Rhino 18483 White Permanent Poly Label 1/2"
Dymo Rhino 18488 White Flexible Nylon Label 1/2"
Dymo Rhino 18489 White Flexible Nylon Label 3/4"
Dymo Rhino 18051 White Heat Shrink Tubes 1/4"
Dymo Rhino 18055 White Heat Shrink Tubes 1/2"
Dymo Rhino 18057 White Heat Shrink Tubes 3/4"